The Boston Area recently gathered at St. John’s Seminary for a Mass and Orientation for our Area Pilgrims who are attending the 2018 Lourdes Pilgrimage. The gathering was led by Stacey Reisman and 2017 Lourdes Pilgrimage Chairs, Nancy and Craig Gibson. Thank you to Msgr. Moroney for offering a moving homily and an exceptional reflection at the Orientation. In his homily, Msgr. reminded us “to beg the Lady dressed in white, to pray to her son, through whom she and we were made, to send forth his Spirit once again, to renew the face of the earth.” In his reflection, Msgr. shared his secret about Lourdes—that we are closest to God in our littleness, our brokenness, our sickness, and our pain. You can read his beautiful homily and his inspiring reflection on the ’17 Lourdes journey here: http://sjsrector.blogspot.com. The orientation included a panel discussion that left everyone feeling more inspired for the journey ahead to Lourdes. All involved laughed and shared tears in recalling life changing moments from past pilgrimages and expressed their excitement in what lays ahead. We offer special thanks to those who appeared on the panel: Jim and Cynthia Fagan, Msgr. Moroney, Ray Bastarche, Stacey Reisman, and Nancy Gibson. Stacey brought home the essence of the Pilgrimage by reminding us that the role of a Knight and Dame is to care for and walk with others; to serve; and to help. It was a wonderful gathering in advance of a remarkable Pilgrimage. We are grateful to Nancy and Craig, Stacey, Msgr. 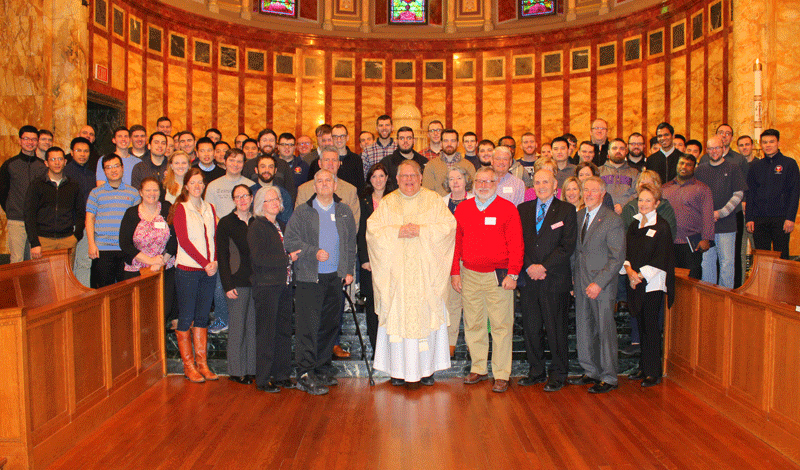 Moroney and the entire St. John’s Seminary community for hosting this orientation and Mass. We extend our deepest appreciation to CeCe and Mike Donoghue, the 2018 Lourdes Chairs and everyone from the Order involved with the Pilgrimage. Our prayers go with all 2018 Lourdes Pilgrims on this special journey. Thank you for all you do to live out our calling in the world. Pictured above in the St. John’s Chapel are seminarians, our malades and caregivers, as well as other pilgrims, both first-timers and veterans, who will be travelling to Lourdes this year. Centered in the photo is our dear friend, Rector of St. John’s and Malta Chaplain, Msgr. Moroney, who provided a special blessing to pilgrims after celebrating Mass.